The focus of my blog is to review book series and not individual novels, but I am going to make a rare exception for P.J. 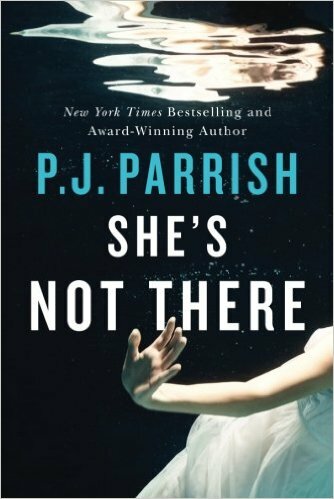 Parrish, writers of the Louis Kincaid series, because the authors asked me if I could review their latest standalone novel, She’s Not There, and I couldn’t say no. I love their Louis Kincaid series, and I was excited to get a chance to read material outside the series and believe me, it was well worth my time. The story begins in a Ft. Lauderdale emergency room with a women that has amnesia as a result of a severe concussion. Slowly her memories begin to come back starting with her first name, Amelia. Even though she doesn’t remember anything about the events that resulted in her concussion, she does have the dreadful fear that her life is in danger, and decides to flee from the hospital. As the story progresses she discovers that she’s not only running for her life, but also from the person that she’s become. The exciting part about this read is watching Amelia’s life unfold before her, and as each layer is peeled away, the story becomes more intriguing. As Amelia is working on regaining her memories, the people involved in her life are also having a revelation, which includes her husband Alex, a wealthy lawyer, and his law firm partner Owen, and his family. For all of them, life will never be the same. One character that really stands out is private investigator, Clay Buchanan. Buchanan’s specialization is finding people that don’t want to be found and he is very talented at it. Buchanan sees the hunt for Amelia as a typical case of a wife that doesn’t want to be found by her husband, but this case turns out to be anything but typical. This project forces him to face his past and contend with an ethical dilemma that has no positive outcome. Amelia’s amazing journey begins in Florida and ends in San Francisco but she doesn’t do it alone. Amelia meets a number of kind strangers during her journey that reminds all of us that goodness does exist in the heart of humanity especially during the times of trouble. With complicated characters and a suspenseful plot, She’s Not There is one book that you can’t put down. P.J Parrish is a pen name for two very talented sisters, Kelly Nichols and Kris Montee, who have won numerous awards for many of their previous novels which are well deserved. To learn more about P.J. Parrish check out my review of their Louis Kincaid series. I would like to thank the publisher, Thomas & Mercer, for providing me a copy of She’s Not There. Posted in Crime Thriller.Tagged Book Review, Book Review Blog, books, Crime Thriller, PJ Parrish, Thriller. I have heard some great things about this on, I was on the fence but now will need to read it! I am reading Weepers at the moment, a fantastic (stand alone 😉 read. It’s by Nick Chairkas, nickchairkas.com is his site for info. This is the best thriller I’ve read in a long while! It looks like Weepers is getting some good reviews, I may have to check it out. Too bad it is a standalone.